This week, Walt Disney bought the rights to Lucasfilm for a cool $4 billion. So, yes: Disney now own Star Wars. This is a big deal. Lucas has handed over his legacy. Naturally, this has caused some outrage amongst Star Wars fans but most of these complaints are unfounded. A common fear is that Disney will tarnish the franchise, delivering films aimed at Disney’s trademark younger audience. But Lucas himself did that with Episode I and if the franchise can survive Jar Jar Binks then it can survive anything. Some Star Wars fans have voiced their concern that Disney will milk the franchise for every last penny with huge amounts of spin-offs and cash-ins. But those people should be asked: where have you been living for the past 45 years? This is Star Wars. It practically invented movie merchandise. Lucas himself has happily expanded his universe into a TV series, re-releases, novels, comics, toys, computer games, fancy dress, Lego, Pez dispensers and everything in between. And why not? Star Wars would not have achieved such immortality on the basis of six movies alone. There is not much left for Disney to add, except possibly a theme park, and which self-respecting Star Wars fan could resist riding a Millennium Falcon rollercoaster? 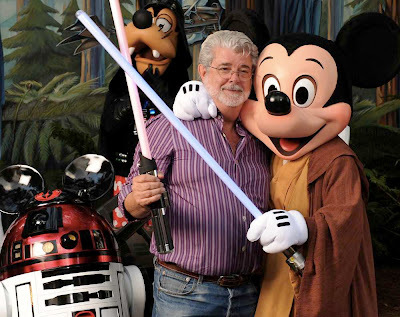 The truth is there is no-one better suited than Disney to inherit Star Wars. Arguably, there is no-one other than Disney to inherit Star Wars. The House of Mouse has the far-reaching infrastructure to handle the acquisition, both logistically and creatively. Other studios would crumble with the magnitude of the task. Well, without wasting any time, Disney has announced that Star Wars Episode VII is due out in 2015. And so we arrive at the truly controversial point of the handover. Presumably, Episode VII will be a sequel but what else is left to explore? Following Return of the Jedi, the Empire had crumbled, Palpatine had been chucked into the heart of the second Death Star and Vader found redemption. Plus, any sequel is likely to override the Expanded Universe, laid out in the novels. After all, the novels have chronicled the Star Wars universe for thousands of years after Return of the Jedi (Han and Leia have grandchildren, Chewbacca has died and so on) and this history is now accepted as canon. To suddenly dismiss this Universe will upset a lot of fans (and novelists). But Star Wars began with films and that is where it must return in order to guarantee another 45 years of lightsabres and droids. And think of the possibilities. Disney also own Pixar and Marvel. Obviously, don’t expect to see the Avengers flying around in X-Wings any time soon or WALL.E making a cameo alongside R2, as fan-pleasing as those big-screen mash-ups would be. However, the real opportunity here lies in the creative mash-up. Disney now has an arsenal of top creative talent amassed through their collaborations with Pixar and Marvel. Imagine an Episode VII directed by John Lasseter and written by Joss Whedon with a story provided by Lucas. It is an exciting possibility. But regardless of your feelings, there is one important thing to focus on: Star Wars will live on.